"Ήταν μια απίστευτη εμπειρία και έχω μοιραστεί καλές στιγμές με υπέροχους ανθρώπους"
Στη συνοικία Schöneberg, σε απόσταση αναπνοής από τα κύρια αξιοθέατα της πρωτεύουσας, το σχολείο μας γλώσσα προσφέρει στους φοιτητές μια μοναδική ευκαιρία να παρακολουθήσουν μαθήματος γερμανικών σε μία από τις πιο όμορφες περιοχές της πόλης. Πολλά καφέ, μπαρ και εστιατόρια μπορούν να βρεθούν στους δρόμους ζωντανή αυτή κεντρική περιοχή, εύκολα προσβάσιμο με τη δημόσια συγκοινωνία. Από το σταθμό του μετρό ή η στάση του τραμ, θα έχετε δύο λεπτά μακριά από το ευρύχωρο και φιλόξενο εγκαταστάσεις του κέντρου μας πορεία. Μαζί με τα μεγάλα και φωτεινά αίθουσες διδασκαλίας, εξοπλισμένα με εγκαταστάσεις πρώτης κατηγορίας μάθησης, το σχολείο έχει μια συνεδριακή αίθουσα, ένα internet café, καθώς και ένα ευρύχωρο σαλόνι, όπου οι μαθητές να συναντηθούμε στη διάρκεια των διαλειμμάτων και να αγοράσετε σάντουιτς και ποτά. "Εξαιρετικός τρόπος να περάσετε μια εβδομάδα στο Βερολίνο!" 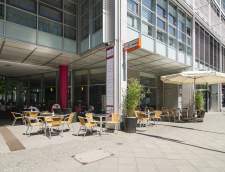 Our school is located in the very heart of the administrative, commercial and cultural heart of Berlin just around the corner from the beautiful Gendarmenmarkt and footsteps away from the famous Friedrichstraße. 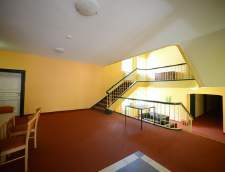 We occupy the second floor of an attractive modern building with easy access to all public transport connections. On the ground floor of the building, there is a café and also a restaurant offering more substantial meals as well as many other places to eat and drink in the immediate vicinity to suit every pocket. We have of course also a recreation area in the center of the school where students meet and get to know each other over a drink and a snack during their break. We have 23 modern well-equipped classrooms furnished to a high standard and offer internet and W-LAN access. There is also a specially designated computer room for online learning in combination with a library as well as a conference size multi-media room offering high-quality film and audio facilities. 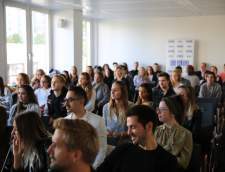 In the capital city of Berlin, F+U specialises in professional and continuing further education, as well as in commercial retraining and qualifications. The successful dual model bachelor degree programmes at the International University of Cooperative Education (Internationale Berufsakademie - IBA) and the latest distance, full-time and dual master’s programmes at the University of Applied Sciences for Business, Technology and Culture (Hochschule für Wirtschaft, Technik und Kultur - HWTK) offer young people established, practical and internationally orientated educational opportunities that will also gradually become open to international students. 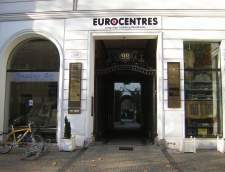 Since 2013, the F+U Academy Of Languages Berlin has complemented this wide range of courses with academically demanding language and computer courses of an international calibre, and thereby continues a tradition first begun in 1980 in the romantic Neckar city of Heaidelberg. 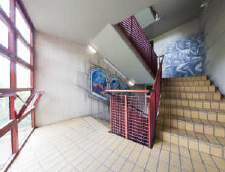 The parent of all F+U language schools, the Academy Of Languages Heidelberg teaches around 9,500 learners from over 100 countries every year and is one of the largest and most successful language schools in Germany. Additional schools in Tenerife, Darmstadt and Chemnitz have extended the scope of the courses offered, also geographically. 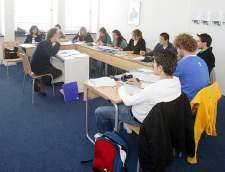 All of our language learners in Berlin – whether international students seeking to improve their German in readiness for higher education or to prepare for the Feststellungsprüfung with the help of our International Prep School, or local people aiming to improve their foreign language skills, for example in Business English or TOEFL preparation – can profit from this innovative network of teaching experience and educational competence. It was in 1984 when we started teaching German as a foreign language. Since then thousands of students from all over the world joined our classes and many of them returned a second and sometimes a third time. Both of our schools are in the very centre of the two most attractive German cities: Munich and Berlin. Thanks to our highly qualified teachers, the welcoming atmosphere and the modern teaching facilities we have earned a very good international reputation. In our classrooms, students from all over the world meet to learn German. Our teachers as well as the other members of our school office team are always available for advice. A student library and free internet access (even wireless) is at our students‘ disposal. Our fully equipped kitchen is a popular hang-out during the breaks and enables an intensive exchange between students and teachers beyond lesson time. Here, extra-curricular activities for the evenings and weekends are planned and these often form the beginning of lasting friendships. BWS Germanlingua is committed to offering quality German language courses to foreigners in a pleasant environment that respects the values of each participant, with the aim of strengthening communication between different linguistic communities in the world. 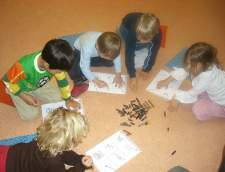 We do not only focus on teaching the German language, but also the German culture and costumes. Our staff and teachers will do their utmost to integrate every student and will always be happy to help and give advice also beyond teaching hours to make Germany your home away from home! We believe that excellent teaching is the most essential asset to a successful school. Due to continuous further training, our qualified and experienced teachers are well acquainted with the latest developments in the area of German as a foreign language. You will note that our instructors can be seen as highly motivated, very competent and knowledgeable friends who are teaching the class. As a result, the members of our staff are not only available to discuss matters of German language but are also happy to help you with advice on other subjects of life. A lot of times they even organize our extra-curricular activities. "Η καλύτερη εμπειρία που είχα ποτέ." "Άριστο σχολείο - είχα πολύ καλούς δασκάλους και ένα μεγάλο χρονικό διάστημα." With over 50 years experience as an international language provider, teaching German as a foreign language has always had an important focus in the work of Carl Duisberg Centren. Our German Language Courses are offered in Berlin, Cologne, Munich and Radolfzell on Lake Constance. At the Carl Duisberg Training Centers you will be taught by experienced trainers, who all have a university degree. In lessons great emphasis is put on training communication skills. The learning progress is measured according to the Common European Framework of Reference for Languages. Prior to the start of the course your actual language ability will be assessed by a placement test. On course completion you will receive an official certificate of attendance. At various stages of the course program, you can have your improvement documented by taking the internationally recognized telc examinations. Naturally, at the four Carl Duisberg Training Centers, a media resource center with a multitude of teaching materials is available. This also includes computer learning programs for self study. You will receive all books and materials used in the lessons free of charge which can then be kept at the end of the course. Additionally, there are no extra costs for registration, placement test and weekly interim tests. For those who decide to learn a foreign language in the country where it is spoken, they will also get to know the culture, customs and ways of its inhabitants. The same applies to your language course in Germany. The varied leisure and cultural program creates relaxed, realistic everyday situations, where you can put your newly acquired language knowledge into practice. At the same time you can gain an insight into the German culture and mentality. Carl Duisberg German courses are offered at four very different locations: you can choose between the capital Berlin, the Rhine metropolis Cologne, the Bavarian state capital Munich, or the charming little town of Radolfzell on Lake Constance. Each location has its own character and its own merits. Learning German at Alpadia Berlin-Wannsee offers you not only a fantastic summer learning experience, but also the opportunity to meet students from all over the world. With morning classes focussed on communication, the interactive and animated approach to learning German allows you to boost your confidence and significantly improve your language level. With a selection between a Standard, an Intensive or Standard + Private course, Alpadia caters to different needs. "Ήταν ένα πολύ ζεστό και φιλικό είδος του σχολείου"
Πόδια μέσα στο νερό (ή σχεδόν). Το κέντρο μας φυσικά βρίσκεται σε ιδανική τοποθεσία στις όχθες της λίμνης Werbellinsee. Περιβάλλεται από το δάσος, πανεπιστημιούπολη μας βρίσκεται σε μια τεράστια προστατευόμενη περιουσία περισσότερα από 100 εκταρίων, όπου κυριαρχούν η φύση και η λίμνη. Έχουμε δικό μας παραλία, αθλητικό κέντρο, γήπεδα Μπιτς βόλεϊ, μεγάλη οθόνη κινηματογράφος, περίπτερο και νυχτερινό κέντρο, καθώς και πολλές άλλες αθλητικές και ψυχαγωγικές εγκαταστάσεις για να ενθαρρύνετε μια κοινωνική ατμόσφαιρα. Κάθε υπνοδωμάτιο είναι εξοπλισμένο με ιδιωτικό μπάνιο με ντους. Τάξεις είναι απόλυτα εξοπλισμένο για τόνωση διδασκαλία γλώσσας και βρίσκεται μόλις λίγα μέτρα μακριά από τα υπνοδωμάτια. Οι μαθητές απολαμβάνουν δωρεάν πρόσβαση στο internet σε όλη την πανεπιστημιούπολη. Όλα τα μεγάλα αξιοθέατα του Βερολίνου είναι εύκολα προσβάσιμα χάρη στις εβδομαδιαίες εκδρομές που προσφέρονται από ALPADIA. έκανε deutsch-institut είναι πολύ κοντά στο Friedrich - και Torstrasse. Σύγχρονο Ινστιτούτο μας βρίσκεται σε ένα γραφείο με βάση Novalisstrasse 12 κατασκευάστηκαν το 2006. Το Ινστιτούτο βρίσκεται σε δύο ορόφους, οι αίθουσες διδασκαλίας είναι φιλικά και άνετα. Στα διαλείμματα οι μαθητές να πάρετε καφέ και αναψυκτικά, από μηχανήματα αυτόματης πώλησης στην καφετέρια και να χρησιμοποιούν το Διαδίκτυο. Το καλοκαίρι, μπορείτε να χαλαρώσετε στη βεράντα του τελευταίου ορόφου απολαμβάνοντας τη σχάρα ή το ποτό. "Πραγματικά έμαθα πολλά, γέλασε πολύ και άρεσε πολύ? ήταν μια υπέροχη εμπειρία!" 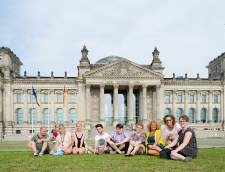 Homestay Trainer Berlin is located in the heart of Berlin and is one of the most popular private schools in Germany. The school specializes in teaching German to foreign students like you and offers also Business German in economics and law as well as a special kids training for girls. The school's class size is very small (1 students maximum) and the trainer is a native German speaker born in Berlin with lots of experience and knowledge about Berlin. Because of the one-to-one-setting, the trainer is able to react immediately on problems or questions which may come up during the tuitions. In the trainer's home are living only girls (the trainer and the 9 years old daugther) so that the program is especially suitable for girls and women. Safety, feeling comfortable and quality are important points when it comes to the security of kids. The trainer takes care of the kids as if they were her own kids. Learning German is nowhere more exciting than in Berlin! The German Capital has developed within only a few years again to a genuine metropolis. Berlin is certainly not beautiful, not elegant and glamorous – but it is cool and trendy, full of variety and so refreshingly different that you have to experience it yourself when you want to understand why it is attractive to so many people. If you decide for one of our Residence Courses in Berlin you will not only see a fascinating world metropolis, but you will also get the opportunity to meet people from the most different nations and cultural backgrounds. 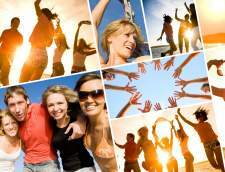 What could be more fun than discovering Berlin together with your new friends you have made while studying German! 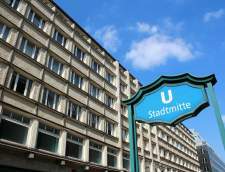 The residence finds itself not only in Berlin’s most central district, Berlin-Mitte, but also in the cultural heart of the capital.From there, all of the important sites can be easily reached on foot. From the Reichstag to the Chancellor’s Office to the Brandenburg Gate, each is a maximum fifteen-minute walk. Potsdamer Platz as well as the Holocaust and Berlin Wall Memo-rial are in immediate vicinity of the residence. And with Berlin’s central train station practically at the door (a short 5 minute walk), all the other attractions can be quickly reached. The residence building offers all amenities: double and four-bed rooms with en suite bathroom and toilet facilities, a sky lounge with a spectacular view of the city, a rooftop terrace, a big garden and the most modern of seminar rooms. "Εξαιρετικές μαθήματα και πολύ καλές δραστηριότητες ελεύθερου χρόνου"
"Όλα πολύ αποτελεσματικά και ταυτόχρονα εγκάρδια"
GLS είναι η μόνη γλώσσα σχολείο στη Γερμανία με 16.000 τ.μ. πανεπιστημιούπολη - συμπεριλαμβανομένης της δυνατότητας να ζήσουν στην πανεπιστημιούπολη, ενώ μαθαίνουν γερμανικά στο Βερολίνο . Η πανεπιστημιούπολη είναι σαν ένα πάρκο - μια πράσινη όαση στο κέντρο του Βερολίνου. Η GLS έχει βραβευτεί 5 φορές ως "η καλύτερη σχολή ξένων γλωσσών στη Γερμανία": περισσότερα Η GLS είναι εγκαταστημένει στο ιστορικό κέντρο του Βερολίνου , στο trendy "Prenzlauer Berg": 100 χρόνια πρίν, η περιοχή αυτή, γνωστή πλέον ως Prenzlauer Berg χαρακτηριζόταν ως φτωχογειτονιά.Μετά το τέλος του 2ου Παγκοσμίου Πολέμου, η Prenzlauer Berg αποτέλεσε μέρος του Ανατολικού Βερολίνου όπου διέμεναν πολλοί καλλιτέχνες και διανοούμενοι. Σήμερα, μετά την πτώση του τείχους, θεωρείται μια από τις πιο σύγχρονες περιοχές της πόλης. Kastanienallee 82 ... είναι η σημερινή διεύθυνση του GLS (Χάρτης). Σ'αυτήν εδώ την οδό συχνά προβάλλονται ταινίες και πραγματοποιούνται επιδείξεις μόδας, γι' αυτό και είναι γνωστή ως casting ally. Περισσότερες απο 40 καφετέριες, μπαράκια και καταστήματα ενδυμάτων με την υπογραφή διάσημων καλλιτεχνών αποτελούν μερικά από τα σημεία ενδιαφέροντος που βρίσκονται κοντά στο GLS. Participating in this program, our students get the unique opportunity to get all the advantages from the language stay in Germany. 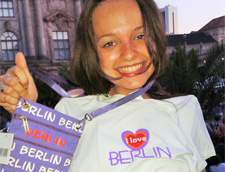 As they live and learn German in the youth residence, where they can get acquainted with other young people, feel the student atmosphere in the residence and experience the spirit of Berlin, the city full of contrasts. The students get the German Classes (20 lessons per week) in the morning and in the afternoon 2 times per week they get the short excursions. 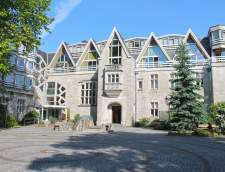 The German Course takes place in the residence, where the students stay. For the Summer College students we offer 2-bedded rooms, breakfast included. WC/Shower is situated in the corridor and will be shared with other students. Here you can get many other services as WI-FI, laundry, drying etc. Also for catering, you do not need going far, as you can have meals also in the College Residence. 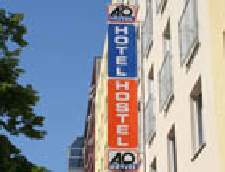 The Summer College students won´t be bored coming to the trendy metropole Berlin. With our guide, you will discover the important historical places in Berlin. Apart from the local sightseeing, we also organize the trips to Potsdam and other worldwide famous attractions outside of Berlin. We hope you'll be able to join us this summer and become a part of our summer college community. Κέντρο σεμιναρίων στον ποταμό ΔούναβηΣτο Regensburg, είμαστε οι επισκέπτες των σιδηροδρομικών Γερμανικά σεμινάριο και κέντρο εκπαίδευσης, που βρίσκεται στην άκρη της πόλης, στις όχθες του ποταμού Δούναβη. Από τη μία πλευρά το σχολείο εγγυάται ειρήνη και ηρεμία, καθώς βρίσκεται στο κέντρο της λιβάδια και αγρούς? από την άλλη πλευρά συνδέεται με τη δημόσια συγκοινωνία και είναι μόνο ένα μικρό λεωφορείο βόλτα (10-15 λεπτά) από το κέντρο της πόλης.Μοντέρνα, φωτεινά αίθουσες διδασκαλίαςΤο πανέμορφο τοπίο που περιβάλλει το κέντρο μας πορεία δελεάζει τους επισκέπτες να λάβουν βόλτες, πεζοπορίες και Ποδηλατικές εκδρομές. Το ίδιο το κτίριο είναι σύγχρονο και διαθέτει πολύ φωτεινές αίθουσες διδασκαλίας με όλες τις απαρχαιωμένο εξοπλισμό και την υποδομή που απαιτείται για την ιδιαίτερα αποτελεσματικής διδασκαλίας γλωσσών. Οι μαθητές θα στεγάζεται στον πολύ ίδιο τόπο όπου κρατούνται τα μαθήματά τους, και θα απολαύσετε τη μεγάλη ποικιλία από εγκαταστάσεις που προσφέρει το κέντρο σεμιναρίων για δραστηριότητες αναψυχής.Θερινά τμήματαΓια τους νεότερους ενήλικες μας προσφέρουμε θερινά μαθήματα με 25 μαθήματα την εβδομάδα. Ενώ τα μαθήματα είναι εξίσου απαιτητική και αποτελεσματική αυτά του τα εντατικά μαθήματα, ο μειωμένος αριθμός των μαθήματα επιτρέπει περισσότερο χρόνο ψυχαγωγικές δραστηριότητες το απόγευμα. Όπως οι περισσότεροι από τους συμμετέχοντες των μαθημάτων μας καλοκαίρι είναι φοιτητές, θα έχουμε μια ακαδημαϊκή προσέγγιση στη διδασκαλία με έμφαση σε όλους τους τομείς της μάθησης της γλώσσας (ανάγνωση, γραφή, ακρόαση, γραμματική και έκφραση).Τα επίπεδαΣτο Regensburg προσφέρουμε μαθήματα γερμανικών για τα επίπεδα Α1 Β1 σύμφωνα με το κοινό ευρωπαϊκό πλαίσιο αναφοράς για τις γλώσσεςΜέγεθος της τάξηςΤάξεις μας αποτελούνται συνήθως από 5-10 σπουδαστές. Λόγω του μικρού μεγέθους διασφαλίζει ότι η ατομική προσοχή δίνεται σε κάθε συμμετέχοντα δόση του κύκλου. Εστιάζουμε πάρα πολύ σχετικά με την επικοινωνιακή προσέγγιση της γλώσσας, ενώ δεν παραμελεί γραμματική, θα δώσουμε προσοχή να κάνει κάθε μαθητής να μιλήσουμε και να συμμετάσχουν.ΔοκιμέςΌλοι οι συμμετέχοντες λαμβάνουν μια εβδομαδιαία εξέταση που καλύπτει όλο το περιεχόμενο των μαθημάτων διδάσκονται την προηγούμενη εβδομάδα, έτσι ώστε οι φοιτητές και καθηγητές όσο μπορεί να αξιολογήσει την πρόοδο που σημειώθηκε στη γερμανική γλώσσα.ΕργασίαΘα έχουν αρκετό χρόνο για εξωσχολικές δραστηριότητες, όμως οι φοιτητές μας αναμένεται επίσης να κάνεται κάθε μέρα. Είτε είστε φοιτητής, είτε επαγγελματία, ή ταξιδευτής, υπάρχει ένα κύκλος μαθήματος ξένης γλώσσας στο Βερολίνο που είναι κατάλληλος για σας. Υπάρχουν μάθημα γερμανικών για όλα τα γνωστικά επίπεδα, τις ηλικίες και την χρονική διάρκεια. Απλά επιλέξτε ένα είδος προγράμματος από την παρακάτω λίστα για να ξεκινήσετε.